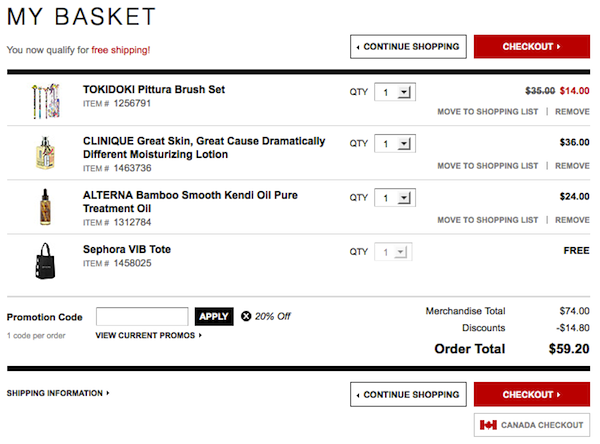 Sephora had its real Friends & Family sale this weekend, from 11/8-11/12. I didn't need too much since I was able to take advantage of the sale a couple of weeks ago... but I did get few things. Tokidoki Pittura Brush Set I got this during the last haul and I decided to get another one. It's cute and perfect as a Secret Santa gift! Dramatically Different Moisturizing Lotion (6.7 fl oz) I've been using the gel version of this moisturizer for years. I just realized that I ordered the lotion variation by mistake. I hope I can exchange it at Sephora! Boo! Bamboo Smooth Kendi Oil Pure Treatment Oil (1.7 fl oz) After a year and a half of using the Alterna sample I bought, I finally ran out of the oil. It's THE best de-frizzing hair treatment I've ever used. It tames and smooths my crazy mane and gives it shine like no other. I'm absolutely in love with it. Did you get anything during this Friends & Family sale?